My first academic thrill came from a ‘quick and dirty’ little protocol our undergraduate class used to extract DNA from an agarose gel slice. We used sterilized Eppendorf tubes, an aged and erratic centrifuge, a brand-new gel electrophoresis kit, and DNA samples scrounged from a nearby research laboratory. To us, the experiment was a vicarious form of research. Most educators will agree that good teaching must focus on helping students become independent learners — practical experience and training are crucial for this process. Though many educational institutions today have laboratories equipped with the necessary instruments (and reagents) for basic biology/molecular biology experiments, many do not. Furthermore, such ‘experiments’ are often no more than demonstrations carried out by teachers. Since molecular biology is one of the most widely utilized sub-fields in biology, let’s estimate the finances of a functional laboratory. A quick cost-estimation comes to a staggering total — at least 20 lakhs — for basic requirements such as a centrifuge (2–6 L), a PCR machine (5–6 L), electrophoresis chambers and power packs (0.5–1 L), a bacterial incubator (0.5 L), microscopes (0.5–1 L), and a spectrophotometer (4–5 L). In addition to one-time buys like hardware, the cost of chemicals, reagents, and maintenance for a laboratory with ten working students may exceed 1 L per year. “When I began setting up a research lab for undergraduates roughly 10 years ago, just the cost of readying the space and buying instruments cost us 10–15 L,” says Urmi Bajpai, ateacher at Acharya Narendra Dev College, New Delhi, who has headed and still runs several research projects powered by undergraduate students. “The concept of involving students in undergraduate research projects has proven to be a great one! It definitely requires hard work and patience but is worth the effort,” she adds. In a previous article, Bajpai mentions the initial grants that got her laboratory going — these, unsurprisingly, run into lakhs of rupees. Such expenses are not unique to the area of molecular biology; ecologists, neuroscientists, botanists, biochemists — whatever be the field of pursuit — there are incredibly useful commercial products that may not fit the expense budget. The bottom line is, experiments in biology can be expensive. Given such costs, can undergraduate students, amateur scientists, or science hobbyists undertake biology experiments without the support of a professional laboratory or an academic institution? Surprisingly, the answer is yes! There are several ways in which an interested person can contribute to a research project or carry out biology experiments on a shoe-string budget. The first name that comes to mind when mulling over the concept of an inexpensive laboratory machine is Manu Prakash. A Professor of Bioengineering at the Stanford University, USA, Prakash runs a curiosity-driven lab, has created major cracks in the instrument-expense-barrier with his foldscope and paperfuge. Prakash describes his group’s innovations as ‘frugal science’ solutions to the problem of insufficient resources. The foldscope is an ultra-low-cost microscope made of paper, which currently costs less than 2 USD (roughly 150 Rupees) and can provide magnification (up to 140X) and resolution (down to 2 microns) similar to those of conventional research microscopes. The paperfuge is a whirligig-based paper centrifuge which can be run by hand, costs roughly 20 cents (15 Rupees), weighs only 2 grams, and can achieve speed of up to 25,000 revolutions per minute. Scientists are slowly clambering out of their ivory towers to acknowledge the need for low-cost robust equipment not only for teaching purposes, but also for scientists on small budgets to help generate preliminary data for risky but promising projects. One laudable effort at equipment construction comes from a recent publication in the Journal of Undergraduate Neuroscience Education, which details the fabrication of a Morris water maze using locally sourced materials. This maze was used by undergraduates to study the effects of diet-induced obesity on cognitive function in rats. The total cost of maze construction, including the tracking system and analysis software cost the authors ~1500 USD, whereas, commercially available mazes from companies such as Ugo Basile or San Diego Instruments cost ~5000 USD. “Constructing your own equipment, provided you have the time for tinkering and standardization, can be most rewarding. Not only do you gain an in-depth understanding of the system, the fabrication costs using locally sourced material are generally a fraction of what you would spend on a commercial product,” says Urvashi Bhattacharyya, a neurobiologist who works as a technical manager at the Institute for Stem Cell Biology and Regenerative Medicine in Bangalore. Although Bhattacharyya (who worked on rat olfaction for her PhD) designed her own experimental arena because no commercial products met her exact specifications, points out why commercial systems are a big boon to some. “If you do not have the expertise (valuable for precision and accuracy) or time to do build your own system, I would advise using a commercial product,” she says. “Behavior systems, especially tracking software, can be excruciatingly expensive,” says Bhattacharyya. “So, the work in this paper was pragmatic and commendable, especially since they were able to replicate the basic experimental results in the maze,” she adds. Another area of research where innovations are rife is in ecology. “When I was studying hornbills in Dandeli, I needed a quick, inexpensive way to measure canopy density. That’s when I came across a publication from the 1970s, which explained how a simple densiometer could be constructed out of cardboard and string,” says Sneha Vijaykumar, who recently completed her PhD from the Indian Institute of Science. “I was an MSc student with no money to buy a fancy densiometer, but managed to construct one, and gathered some useful broad-range data with it. I think that instruments and innovations like these are such good resources for students. What’s even more amazing is that with the appropriate instructions, this construct can still be used by teachers to conduct canopy cover survey lessons for students,” she adds. In 2003, the Arduino project was started by the Interaction Design Institute Ivrea in Italy, to help provide supplies for creating low-cost devices that could interact with their environment — robots, thermostats, and motion detectors. Currently, Arduino is an open source hardware and software company, project, and user community that provides microcontrollers and kits for building digital devices and interactive objects. Arduino has spurred many advances including a do-it-yourself construction kit to build a PCR machine, which is currently available for 599 USD from the OpenPCR project. Besides Arduino, a global community focused on biohacking can provide simplified step-by-step instructions for constructing molecular biology instruments such as agarose gel electrophoresis kits. 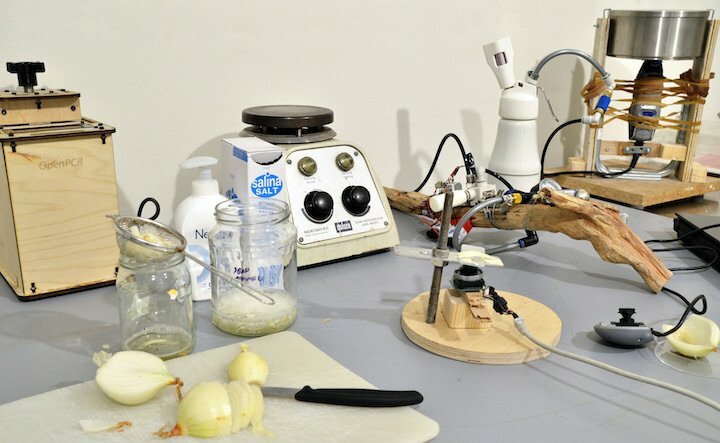 The biohacking or ‘modern do-it-yourself biology laboratory’ movement began to gain momentum in 2008 with groups such as Hacketeria, DIYbio, and GOSH (gathering for open science hardware). These groups are usually international communities of scientists, hackers, and artists, who believe in interdisciplinary cooperation, and practice DIY (do-it-yourself) or DIWO (do-it-with-others) biology. Biohacking hasresulted in the birth of community laboratories such as GaudiLabs and BioCurious. GaudiLabs organizes regular ‘hack sprints’, where people interested in a particular subject meet and work together for short and intense hacking sessions. One such session has produced an optical tweezer which can be constructed for <100 USD using harvested lasers from old DVD drives. Some of the current projects at BioCurious are the BioPrinter (to design an open source DIY cell printer) and the Open Insulin Project (aimed at finding newer, simpler, less-expensive ways to produce insulin). In addition to community laboratories, an average citizen, student, or science hobbyist can contribute to low-budget scientific endeavors by participating in citizen science projects. These are crowd-sourced, community-based projects where volunteers gather information which is pooled and analyzed by a core team of organizers. In India, MigrantWatch is an excellent example of citizen science. Over its duration (from July 2007–August 2015) participants have uploaded over 30,000 migrant bird sightings; although the project has now stopped accepting uploads, it has partnered with the global birding platform eBird to continue listing and recording sightings in India. SeasonWatch is an ongoing project that aims at monitoring seasonal changes in trees; all the data collected is freely available to participants who can analyze the records to explore how seasonal leafing, flowering, and fruiting patterns of trees have been altered (or not?) by climate change. Low-cost science in India: are we there yet? Although we as a nation pride ourselves on our innovative hacks when faced with insufficiency, Indian science has not yet reached its peak in JuGAaD (Justified Guideline to Achieve the Desired State). It is highly probable that our laboratories have academic pasts littered with useful, practical, and low-cost alternatives to many scientific instruments and protocols. Many of these remain unrecorded, or may have been lost to the ever-looming spectre of ‘professionalism’. After all, a result recorded with a commercially produced, well-tested product will be more believable than a locally constructed hack. It is, however, important to note that such hacks should be recorded and preserved in the interests of frugal science. It is hoped that India’s entry into the ‘science hack days’ forum since 2016 will encourage more minds to think of newer low-cost, innovative alternatives to expensive gadgets. Do look out for ‘Science Hack Day India 2018’, which will be held in Belgaum from 12th to 14th October this year — don’t forget to sign up if you have a cool science hack idea!